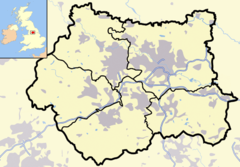 Batley is a town within the Metropolitan Borough of Kirklees, in West Yorkshire, England. It lies 7 miles (11 km) southeast of Bradford, 7 miles (11 km) southwest of Leeds and 1 mile (2 km) north of Dewsbury, near the M62 motorway. It has a population of 49,448 (including Birstall). Other nearby towns include Morley to the northeast, Ossett to the southeast and Brighouse westsouthwest. After undergoing a period of major growth in the 19th century due to the success of the shoddy trade, Batley has more recently undergone a period of decline. Batley is part of a special EU transformation zone. St Paul's church in the Hanging Heaton area of Batley. There has been a church in Batley since the 11th century. The present Batley Parish Church was built in the reign of Henry VI (1422–1461), and parts of the original remain. Despite Batley being an ancient settlement, this is all that remains of any great antiquity. Howley Hall at Soothill was built during the 1580s by Sir John Savile, a member of the great Yorkshire landowners, the Savile family. The house was besieged during the Civil War in 1643 before the Battle of Adwalton Moor but appears to have sustained no serious damage. It continued to be occupied during the 17th century but fell into disrepair. Howley Hall was finally demolished in 1730. Many ruins exist including the cellars of its great hall. Methodism came to Batley in the 1740s and took a strong hold in the town which continued into the 20th century. John Nelson from neighbouring Birstall was a leading lay preacher in the early Methodist movement. Areas of the town, such as Mount Pleasant, were noted for their absence of pubs due to the Methodist beliefs of their populations. During the late 18th century the main occupations in the town were farming and weaving. The Industrial Revolution reached Batley in 1796 with the arrival of its first water powered mills for carding spinning. During the next half century the population grew rapidly, from around 2,500 at the start of the 19th century to 9,308 at the 1851 census. The parish of Batley at this point included Morley, Churwell and Gildersome, with a total population of 17,359. A toll road built in 1832 between Gomersal and Dewsbury included a branch to Batley (the present day Branch Road) which allowed for "the growing volumes of wool, cloth and coal" to be transported. Until then there had only been foot and cart tracks. Around the same time there were strikes in the mills, which led to an influx of Irish workers who settled permanently. Initially this led to some antagonism from residents, due to the cheaper wages demanded by the Irish workers and general anti-Roman Catholic sentiment, but this faded in time. By 1853 Catholic services were being held regularly in the town; its first Roman Catholic church, St Mary of the Angels, was not built until 1870 and is still in existence. By 1848 there was a railway station in Batley, and in 1853 Batley Town Hall was erected. It was enlarged in 1905, and is in the Neoclassical style style, with a corbelled parapet and pilasters rising to a centre pediment. In 1868 Batley was incorporated as a municipal borough, the former urban district of Birstall being added to it in 1937. 1853 also saw the establishment of a small confectionery shop by Michael Spedding. His business would expand, moving to larger premises in 1927 and later becoming Fox's Biscuits. Today, along with Tesco, it is one of the two largest employers in the town. During the late 19th century, Batley was the centre of the "shoddy trade" in which wool rags and clothes were recycled by reweaving them into blankets, carpets, uniforms. In 1861 there were at least 30 shoddy mills in Batley. The owners of the recycling businesses were known as the "shoddy barons". There was a "shoddy king" and a "shoddy temple", properly known as the Zion Chapel. This imposing building in the town centre was opened in 1870, and reflected the popularity of the Methodist movement in Batley. The library was built in 1907 with funds donated by the philanthropist Andrew Carnegie. The library has recently been modernised, with a new microfilm viewer, and reels of the Batley News dating back over 120 years. The paper was founded by James Fearnsides – a reputable local printer. His grandson Clement, later went on to become the mayor of Batley. There was also an active coal mining industry in Batley at this time. The first records of coal mining in Batley date back to the 16th century at White Lee; the last pit in the town closed in 1973. From the end of the 1950s onwards, the need for cheap labour in the town's textile industries drew in migrant labourers from Gujarat, Punjab and other parts of modern day Pakistan and India. The South Asian population of Batley is now around 30%. The Batley village of Hanging Heaton is home to Mill Lane J, I & EY School. Batley is home to a modest commercial and retail centre. This is mostly situated along Commercial Street. The largest shop here is Tesco which is linked to the main shopping street by footbridge. There are several chain shops in the centre, including a Boots the Chemist and until the chains collapse, a Woolworth's which still lies empty. In the town centre is the Batley Shopping Centre, a small shopping centre which has become somewhat rundown since being acquired by Tesco. The supermarket signpost the shopping centre as a thoroughfare to their supermarket. The main retailer in the shopping centre is Iceland, they are currently surrounded by many vacant shops. Renovated former textile mills now form the major part of shopping in Batley. The Mill, Batley The Mill Batley is one of the UK's largest retail mills and is essentially a factory outlet or shopping village with many national & independent fashion & homeware operators. The conception of The Mill, Batley back in 2000 provided what has been a consistent contribution to the area's employment and economic status. Other major retail offers include Redbrick Mill, housing many top end furniture retailers such as Heal's and Multi York as well as local textile manufacturers Skopos. Shackletons - famous for their 1970s TV ad selling high seat chairs for the older generation - also occupy one of the many former mills along Bradford Road. This 'golden mile' of retail is collectively known as the Yorkshire Mill Mile. Wilton Park (known locally as Batley Park) is a large park between Batley town centre and Upper Batley. In its grounds are a butterfly house, the Milner K. Ford Observatory (built in 1966 and home to the Batley & Spenborough Astronomical Society) and Bagshaw Museum. The museum is located in a house built by one of the original "shoddy barons", George Sheard, and features local history, natural history, curios from around the world, and an Ancient Egyptian exhibition. The museum (originally the Wilton Park Museum) is named after its first curator Walter Bagshaw, a Batley councillor and extensive traveller. Batley also hosts the Yorkshire Motor Museum, with a small but varied collection of cars dating back to 1885, and reflecting local car makers as well as more famous marques. Batley Art Gallery, located in the Batley Library building, features contemporary art, craft and photography. Between 1966 and 1977 the Batley Variety Club was frequented by many notable acts including Louis Armstrong, Johnny Mathis, Eartha Kitt, The Bee Gees, Roy Orbison, The Hollies and Cliff Richard, among others. For a brief period it was also named The Crumpet, after which it remained closed for four years surviving numerous applications to have the building demolished. It is now the Frontier nightclub, as it has been since the late 1970s, and hasn't had a refit since. The Frontier was sold to a group of local businessmen in April 2005 and continues to operate as a nightclub whilst also hosting a large number of variety shows and sporting events such as boxing, snooker and darts. In cricket, Batley has several local teams, and is also part of the cricket association for the Heavy Woollen District. The original definition of the latter area was to within a six mile radius of Batley Town Hall. The Heavy Woollen Cup can now be entered by any team within 18 miles of Batley, but there is an upper limit of 64 teams. Batley has an Asian Muslim population made of people from Pakistan and the Indian state of Gujarat. The Gujarati community mainly live in the Mount Pleasant and Warwick Road areas of the town. Pakistani families live in Staincliffe, Hanging Heaton and Batley Carr. Batley Grammar School was attended by Sir Titus Salt, an industrialist who founded the model village of Saltaire, Joseph Priestley, Josiah Wedgwood and controversial writer Tim Fountain. Pop singer Robert Palmer was also born in Batley. Inventor and philanthropist Edward Ashton, who died in 1935, is buried in Batley. Professional snooker player Paul Hunter lived in Batley until his death on 9 October 2006. Louis Hall born 1852 in Batley. He played cricket for Yorkshire. The Hall family were local mill owners. Arthur Roche, Bishop of Leeds, was born in Batley Carr. Batley Carr, Carlinghow, Cross Bank, Hanging Heaton, Healey, Lamplands, Carlton Grange Mount Pleasant, Soothill, Staincliffe, Upper Batley and White Lee. Birstall is addressed for postal reasons as being part of Batley WF17, and has Batley telephone numbers, and for a time before the creation of Kirklees Council, it was part of the former Batley UDC. However, Birstall is generally considered to be a settlement in its own right; residents of Birstall tend to talk of Batley as being a separate place. As Batley shares boundaries with both Dewsbury and Heckmondwike, parts of Batley Carr, Hanging Heaton and Staincliffe are part of Dewsbury, while part of White Lee is in Heckmondwike. There is an area of Ossett known as Healey, which is identical in name to the Batley district of Healey; the Ossett area is sometimes referred to as "Healey Mills" due to the very large congregation of mills that once existed in that area. Monty Python's Flying Circus had a series of recurring sketches in which the members of the Batley Ladies Townswomen's Guild would present famous plays or musicals, or reenact various historical battles, simply by charging at each other, swinging purses and wrestling in the mud. Batley is also the setting for the children's television programme My Spy Family. Batley was used for location filming of the fictional town of Barfield in the 1955 film "Value for Money", starring John Gregson and Diana Dors. This page uses content from the English language Wikipedia. The original content was at Batley. The list of authors can be seen in the page history. As with this Familypedia wiki, the content of Wikipedia is available under the Creative Commons License.